In a world of political cynicism and doubt — when national and international affairs are a long news crawl of dysfunction — we can all learn how to reclaim politics in its truest form from the partnership between Bupaluka village and Kibo. Bupaluka is not densely populated. It has a well. It has livestock and crops. Mud or simple brick houses are the only structures in sight. It has no universities, hospitals or street signs. It is an hour from the closest town. It doesn’t have a flushable toilet, much less a capitol building. Subscribe to our monthly email newsletter for more great stories. But a group in Bupaluka is hard at work writing their own Constitution, which will be ratified by the Ugandan government. This constitution — which in itself is a profound act of self-governance — will help the members of Bupaluka’s Mvule committee organize themselves as they pursue economic development projects for the betterment of their community. As part of Kibo’s Mvule Community Development program, Bupaluka has written bylaws to govern how and where to plant trees, how to fund repairs to their Kibo well, and how to run meetings. They’ve exchanged livestock. They’ve elected a chairperson, a treasurer, and a secretary. They’ve constructed a wooden box to collect funds. They’ve provided business loans to community members and emergency support in times of tragedy. All this from a community that, statistics suggest, has more than a few members who cannot read or write. This set of bylaws — deliberated over months of meetings with the guidance of Mvule Assistant Manager Alex Bamulumbye — will be sent to Kampala to be recognized by the Ugandan government, not as law, but as a formal set of guidelines to keep the group members accountable to one another and to their village. In America, the tyrant in question was King George, but in Bupaluka, it is often nature itself. Between, droughts, sickness, floods, parasites, and funeral expenses, Bupaluka has not had time to look too far into the future. 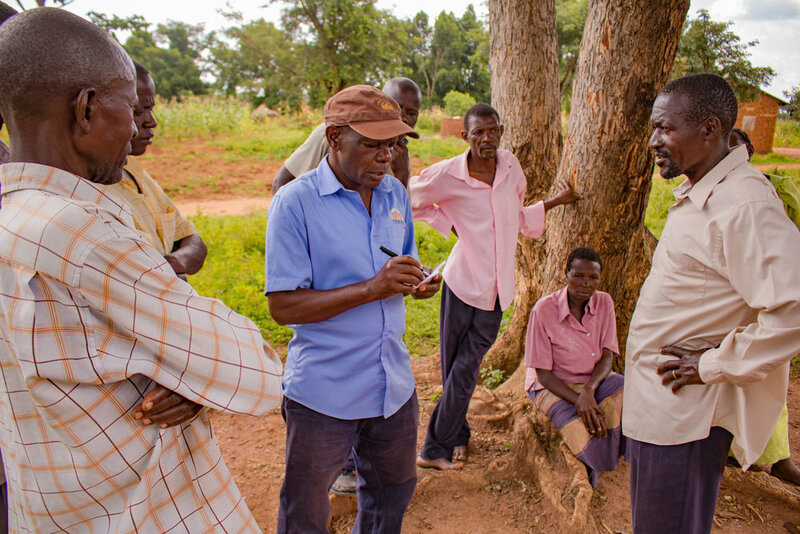 Now, because of Kibo’s development efforts to raise their standard of living, Bupaluka has the freedom to open savings accounts and plant trees for their grandchildren. No individual in Bupaluka could have planted so many trees or written a Constitution on their own. It required a group effort. If politics — as it should be — is the art of deliberation, then Bupaluka is not merely a backward community in need of charity from the West. Quite the contrary. In some respects, they have a better grasp on local leadership, fierce deliberation, and compromise in a world of political strife and dysfunction. Perhaps, then, we should look to Bupaluka as a place where true politics occurs every week under the shade of a Mvule tree. Mutoto, the chairman, may not be James Madison. Maria, perhaps his fiercest debate partner, may not be Alexander Hamilton. And the Constitution they helped create will not carry the same force of law. But something is happening with Kibo Group’s partner communities in Busoga that would make both Madison and Hamilton smile. Politics just became romantic again.